Back in July a class action lawsuit was filed against Meracord (formerly NoteWorld) and Lloyd Ward, the Dallas debt settlement attorney who has sued my wife and I. The first compliant filed was a bit meandering and did not focus that much on the activities of Ward and his debt settlement companies. It appears the filing attorneys and firms have gone back to work and assembled a number of issues that focus their complaint more specifically on Ward and Meracord in an amended complaint filed yesterday in Washington State. The amended class action complaint is filed against: Meracord, Linda Remsberg, Charles Remsberg, Lloyd Ward, Amanda Ward, Lloyd Ward PC, Llyod Ward & Associates, The Lloyd Ward Group, Lloyd Ward Group II, Ward Holdings, and Settlement Compliance Commission. What follows is from the complaint filed. Defendant Meracord has conspired and/or currently conspires with scores (if not hundreds) of front-end debt settlement companies (“Front DSCs”), who together with Meracord compose the Meracord Enterprise. Those Front DSCs include at least the following entities: Lloyd Ward and Associates, Express Debt Settlement Holdings, Law Office of Simon & Bocksch, Freedom Debt Relief, First Rate Debt Solutions, Expert Settlement Professional, P&E Solutions, Freedom Debt Center, Accredited Financial Corporation, Amber Network Inc., Best Debt Options, Beyond Financial Service, Brite Credit Inc. (d/b/a Brite Credit 123), Century Negotiations Inc., Clear Debt Solution, Coastal Debt Solutions LLC, Consumerwise Debt Solutions Inc., Counsel 4 Debt Relief, Countrywide Debt Solutions Inc., Credit Care Corporation, CreditCare Pro, Debt Help Center USA, Debt National Relief, Debt Reinvestment, Debt Solutions, Debt Erase Inc., DebtPointer Inc., DebtPro LLC, DTS Financial Group, E.A.C. Financial LLC, FBL Associates, Freedom Debt Solutions, Help Settle LLC, Helpsettle.com, Innovative Debt Solutions, Lifeguard Financial, Maximum Debt Solutions, Morgan Stevens Financial Solutions Company, National Financial Freedom LLC, Nationwide Consumer Advocacy Group, On Track Financial LLC, Personal Debt Systems of America, Princeton Debt Management LLC, Reduce My Debt LLC, Settle A Debt Inc., Settlement Corporation of America, SilverLeaf Debt Solutions, The Debt Answer, The Debt Cure, US Consumer Report, Vision Debt.com and World Debt Solutions. Many of these Front DSCs have been the subject of state and federal investigations for consumer fraud. Defendant Linda Remsberg (“Remsberg”) is the Owner, President, and CEO of Defendant Meracord. Remsberg acquired Meracord in 2007, having worked for the company for approximately nine years prior to that, primarily in the company’s Seller Finance business unit. As President/CEO, Remsberg oversaw the creation of Meracord’s Debt Settlement business unit, which now generates over 70% of the company’s revenues. Remsberg oversaw the creation of the Meracord Enterprise and, in conjunction with the principals and owners of the Front DSC’s described above, Remsberg continues to conduct and/or participate in the conduct of the Meracord Enterprise’s unlawful activities. None of these things are true. The truth is that after being purchased by Remsberg, Meracord was transformed from a company whose business was devoted almost exclusively to processing payments for private mortgages into a company whose major business involves preying on financially vulnerable consumers by creating the mechanism by which scores of dubious “debt-settlement” companies can easily obtain direct payments from victims’ bank accounts. In that manner, Meracord deliberately supports, facilitates and participates in the criminal conduct described below. Defendant Charles Remsberg is a resident of Washington and the spouse of Defendant Linda Remsberg. At all times, Defendant Linda Remsberg was acting on behalf of her marital community with Defendant Charles Remsberg with respect to the misconduct alleged herein. Defendant Lloyd E. Ward (“Ward”) is an attorney licensed to practice in the state of Texas. He owns and/or controls a byzantine web of corporate entities. These entities include those listed below, all of which, upon information and belief, operate in association with (or under the name) “Lloyd Ward & Associates.” According to its website, LWA is a law firm established in 1992 and located in Dallas, Texas. In addition to other practice areas, the firm publicizes a Debt Settlement practice and touts its “relationships with creditors” who “realize that we are working as diligently as they are to negotiate a debt settlement and remove it from their books.” LWA’s website falsely advertises that its debt negotiation service is “guaranteed in writing to work or your fees will be returned!” At all times, Lloyd Ward was acting on behalf of his marital community with Amanda Glen Ward with respect to the misconduct alleged herein. 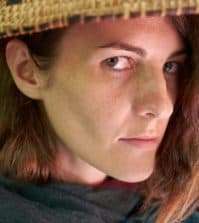 Defendant Amanda Glen Ward is a resident of Texas, the spouse of Lloyd Ward, and the Director of Marketing for LWA and its associated entities. Amanda Ward has the authority to handle and disburse the funds, described below, received by Lloyd Ward Defendants from the Meracord Enterprise. Amanda Ward has participated in, ratified or aided and/or abetted all the unlawful practices alleged herein to have been committed by Lloyd Ward Defendants. Specifically, she has directed and/or participated in the fraudulent solicitation of class members and the transmission over interstate lines of unlawfully obtained funds. In addition, Defendant Amanda Ward has permitted her family trust, the Glen Family Trust, to be used to hide her and her husband’s ill-gotten gains. At all times, Amanda Ward was acting on behalf of her marital community with Lloyd Ward with respect to the misconduct alleged herein. Defendant Lloyd Ward, P.C. is a Texas professional corporation located in Dallas, Texas. Ward serves as the sole Director, President, and registered agent for Lloyd Ward, P.C. Upon information and belief, Lloyd Ward, P.C. also does business as Lloyd Ward Group, LLC. Defendant Lloyd Ward & Associates, P.C. is a Texas professional corporation located in Dallas, Texas. The registered agent for Lloyd Ward & Associates, P.C. is Lloyd Ward, P.C., with both entities using identical addresses. Ward serves as President of Lloyd Ward & Associates, P.C. Upon information and belief, Lloyd Ward & Associates P.C. also does business as Lloyd Ward Group, LLC. Defendant The Lloyd Ward Group, P.C. is a Texas professional corporation located in Dallas, Texas. Defendant Lloyd Ward, P.C. serves as the company’s registered agent, and Ward serves as CEO, Director, and President of The Lloyd Ward Group, P.C. The Lloyd Ward Group, P.C. also operates under the assumed name Lloyd Ward Group II. The certificate of formation states that its purpose is to engage in “legal services and other services ancillary thereto.” Even though The Lloyd Ward Group PC is a law firm purportedly engaged in the practice of law, it shares profits with a non-lawyer. Specifically, it is 42.5% owned by Kevin Devoto, 42.5% owned by Lloyd Regner and 15% owned by Lloyd Ward. Mr. Devoto is a convicted felon who served 18 months for his involvement in a prior fraud and is currently subject to a $2,185,476.29 restitution order. Neither Mr. Regner nor Mr. Devoto are licensed attorneys in Texas, or, on information and belief, in any other state. Ward Holdings, Inc. is a Texas corporation located in Dallas, Texas. Ward serves as the company’s registered agent, President and Director. The company’s charter was involuntarily forfeited in February 2012 for failure to comply with the Texas Tax Code. Defendant Settlement Compliance Commission Inc. is a Texas corporation located in Dallas, TX. Defendant Lloyd Ward & Associates, P.C. serves as the company’s registered agent, and both companies are located at the same Dallas address. Ward serves as a Director of the company, along with two other individuals: Mike Miles and Chris Garrison. Mr. Miles also serves as the Manager of SilverLeaf Debt Solutions, LLC, one of the other entities that was involved in Plaintiff Marie Johnson-Peredo’s Meracord transactions. The relationship between Ward and Mr. Miles/SilverLeaf served as the basis for a disciplinary petition brought by the State Bar of Texas against Ward for various violations of the Texas Rules of Professional Conduct. In order to vastly grow its customer base, while shielding itself from the scrutiny and complaints of those it defrauds, Meracord – at the direction of Defendant Linda Remsberg – partners with an elaborate network of Front DSCs. Meracord uses the Front DSC network to sign up desperate and unsuspecting consumers who are looking for relief from the overwhelming stress of their indebtedness. Typically, a consumer will sign up with a Front DSC representing itself as a single company engaged in the business of debt settlement. Front DSCs seek customers through unsolicited phone calls, email, or mail, as well as internet, television and radio advertising claiming to offer relief for consumers saddled with overwhelming debt. Only later, if ever, does the consumer discover that there are multiple companies involved in the process. The relationships between the various companies are purposefully obscured to prevent the consumer from disentangling the complicated scheme. (h) Meracord is deeply intertwined with the Front DSCs. Remsberg, on behalf of Meracord, often attends debt settlement industry events, where she serves on panels alongside representatives of the Front DSCs, and, upon information and belief, describes Meracord and the Front DSCs as engaged in the joint endeavor of recruiting debt settlement customers. (i) For example, in April 2011, Remsberg attended a conference of The Association of Settlement Companies (“TASC,” which shortly thereafter changed its name to the American Fair Credit Council). At the TASC conference, Remsberg served on a panel with four other panelists – all four of whom represented Front DSCs. One of the panelists was Andrew Housser, CEO of Freedom Debt Relief, a Front DSC involved in the scam that injured Plaintiff Dinah Canada, and which at the time had already been investigated by the Washington State Attorney General’s office for violations of Washington consumer protection laws (discussed in further detail below). The standardized contracts provided to consumers by the Front DSCs contain, at the very least, an agreement for debt settlement services as well as a Meracord “Sign-Up Agreement,” and often contain a myriad of other confusingly worded forms. (h) In almost all cases, the consumer would be far better off simply directing the monthly payments to his/her creditors directly, thereby saving the fees illegally, unfairly and deceptively extracted by the Meracord Enterprise, and preventing the further accumulation of compounded interest. (f) Make false or misleading statements about the factors that affect the customer’s credit score and the impact of the debt settlement program on that score. Moreover, the Front DSCs’ salespeople often pressure consumers into signing (or “esigning”) the contracts quickly, without any meaningful opportunity to review the terms; and for their part, the contract terms are often so confusingly worded as to be unintelligible to the average consumer. (e) Meracord is aware of regulatory enforcement actions against Front DSC’s with whom it does business, yet it takes no steps to cease doing business with these Front DSCs. To the contrary, it often unlawfully facilitates the transfer of accounts from Front DSC’s under investigation to new or other Front DSCs under common control in order to evade regulatory action. Front DSCs tout their association with Meracord as proof of their bona fides and to convince consumers that they are legitimate providers of debt relief services. (b) “[Meracord] is doing business with Lloyd Ward Law Firm. Lloyd Ward Law Firm was suppose to settle my debt and 2 months have gone by and they have not settled any debts. Therefore, they breached their contract. [Meracord] does business with them (I believe they are run by the same person/people. They say they are an “independent” company). They made 2 deductions from my account and refuses to give the money back stating fees for services by LLoyd Ward. They didn’t do anything for me as contracted. Yet, [Meracord] is refusing to refund the money. How independent is that? Just because you have a seperate Federal ID number, doesn’t mean you aren’t owned by the same people. (d) That it “follows the instructions stated in the Meracord contract and at no time acts without authorization from the consumer,” despite the fact that many times the contracts signed by consumers do not contain clear or specific schedules of when fees will be withdrawn, and thus Meracord’s withdrawal of fees must necessarily be the result of separate (unilateral) instructions from the Front DSCs. 55. Meracord perpetuates the fraud by making false and misleading statements of its own through its website, emails and letters to customers, and the Sign-Up Agreements given to customers on behalf of Meracord by the Front DSCs – including Lloyd Ward Defendants. These statements include false assurances that customers are fully “in control” of their accounts, and that Meracord will not disburse any funds without the customer’s permission, when in fact Meracord and its Front DSCs are in control of the debt settlement accounts, routinely disbursing money to themselves for unearned and illegal fees. Meracord also falsely claims that it is not a debt settlement or “debt adjusting” company, even though it meets the statutory definition for such companies, during the relevant time period of this complaint, since it is engaged in receiving funds for the purpose of distributing said funds among creditors in payment or partial payment of obligations of a debtor. Customers who discover the fraudulent activities of the Meracord Enterprise find themselves fighting an uphill battle to disentangle the labyrinthine scheme and determine the party ultimately responsible for the scam. The ephemeral Front DSCs disappear, stop answering phone calls, disclaim responsibility, or resort to outright threats and intimidation; and Meracord also refuses to admit any responsibility for the fraud in which it was complicit. Indebted consumers are thus left in worse positions than if they had never sought help at all, having often paid thousands of dollars in exorbitant and illegal fees that could have gone towards reducing their debt loads. Remsberg and Meracord profit from the fees generated by each consumer enrolled by the Front DSC members of the Enterprise, knowing that the fees are generated by fraudulent and deceptive means, and knowing that often the fees charged are flatly illegal. (a) A Kansas court found that Lloyd Ward Defendants’ debt settlement practices violated the Kansas Consumer Protection Act and the Kansas Credit Services Organizations Act, harming the plaintiff in that case by causing a judgment to be entered against him and by causing him “considerable anguish, stress, and despair.” The court awarded the plaintiff $100,000 in damages ($4,347.82 for each of the twenty-three deceptive acts in which Lloyd Ward Defendants engaged), in addition to attorneys’ fees. (b) The Connecticut Department of Banking issued a Cease and Desist Order in September 2011, requiring Lloyd Ward Defendants to pay a $500,000 civil penalty for violations of Connecticut’s statutory requirements for debt adjusters/negotiators. The violations included charging fees that the Department found to be “excessive” and engaging in debt negotiation without a license. The Department also required Lloyd Ward Defendants to specifically repay fees to a Connecticut resident who was charged excessive fees and “received no benefit” in return. When asked under oath in other litigation whether he intended to pay the fine issued by Connecticut, Ward blatantly stated, “No”. On information and belief, to this date Ward has neither appealed nor paid this fine, despite the fact that the order requires payment within thirty days. (c) On July 29, 2010, the North Carolina Attorney General issued a cease and desist letter to the Lloyd Ward Defendants and required them to identify within ten days all North Carolina customers. On information and belief, Ward simply ignored this cease and desist letter. (e) In April 2012, a class-action lawsuit was filed against Lloyd Ward Defendants in Washington State Superior Court, along with SilverLeaf Debt Solutions (another of the businesses involved in the scam that injured Plaintiff Marie Johnson-Peredo). The lawsuit alleges violations of the Washington Debt Adjusting Act and the Washington Consumer Protection Act, as well as breach of fiduciary duty, on behalf of Washington customers of Lloyd Ward Defendants. On information and belief, Lloyd Ward Defendants have received cease and desist letters from other states or state attorneys general, including West Virginia, and have ignored these inquiries. Ward is also personally the subject of an ongoing disciplinary petition filed by the Texas Commission for Lawyer Discipline, alleging six separate violations of the Texas Disciplinary Rules of Professional Conduct. The allegations revolve around Ward’s interactions with SilverLeaf Debt Solutions. Lloyd Ward & Associates, P.C. currently has an “F” rating with the Better Business Bureau, based on dozens of complaints having been filed against the company in the last three years. A. You can answer these. B. But even better, it seems pretty simple to just post enough good comments to simple [sic] drive any bad ones so for [sic] Down the list that no one can find them anyway. We just don’t want any comment like that being left alone. I personally just posted the following: dear Lloyd Ward, pls tell Kervin tbat Kelly has just been incredible for us. We really had some challenges and it’s looking like the light is appearing at the end of the tunnel. Thanks Lloyd Ward. On information and belief, neither Ward nor Defendant Amanda Ward objected to Devoto’s posting of misleading comments falsely purporting to come from LWA customers, thereby ratifying the false and misleading postings. E-mail communications and Internet postings such as the one described above are examples of the use of the interstate wire facilities to continue and perpetuate the illicit goals of the criminal enterprise alleged herein. 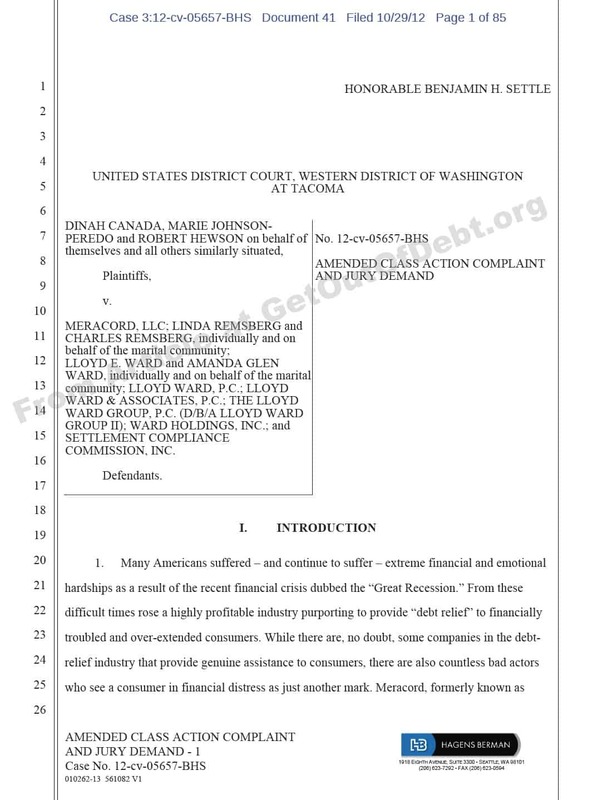 Lloyd Ward Defendants profit from the fees generated by fraudulently inducing consumers to sign up for their debt settlement “services,” and profit from their association with the Meracord Enterprise by using Meracord to legitimize their services and by convincing consumers that their money will be safe in a Meracord account which only the consumer can control. In addition, because Meracord usually automatically deducts payments from the consumer’s bank account, Lloyd Ward Defendants are more likely to reap illicit gains from consumers automatically after signing them up, as opposed to a system where consumers would later – after having reviewed and contemplated the “services” being offered – have to make a separate payment. Debt Relief, which has had 251 complaints filed with the Better Business Bureau in the last three years and been the subject of an investigation by the Washington Attorney General which resulted in a March 3, 2011 consent decree. The Washington State consent decree “stems from the Attorney General’s claims that Freedom Debt Relief in some cases charged consumers more than the allowed 15 percent of the total enrolled debt, taking its fees before the time permitted and failing to adequately inform consumers about how the program worked violating Washington’s debt adjusting act and consumer protection act.” As a part of the consent decree, Freedom Debt Relief agreed to pay approximately $800,000 in restitution for Washington consumers, and was forbidden from contracting with new Washington customers without notifying the Attorney General’s office. In order to thwart regulatory actions, evade detection and continue to victimize financially distressed consumers, the Front DSCs that are members of the Meracord Enterprise regularly enter into agreements between and among themselves to transfer “portfolios” of victims. For example, in late 2010, Front DSC ‘The Debt Answer’ faced numerous complaints and regulatory issues including an investigation by the Connecticut Department of Banking. Instead of complying with the law, The Debt Answer sold its portfolio of 3,407 “active” debt settlement victims to Ward on January 1, 2011. The Debt Answer itself had apparently earlier purchased an undisclosed number of these victims from another Front DSC, Simon & Bocksch – one of the Front DSCs involved in the scheme to defraud Plaintiff Dinah Canada, as described below. On information and belief, Meracord facilitates these fraudulent “portfolio” transfers by wiring the unlawful fees to the new entity without any authorization from the consumer account holders, who generally remain unaware that their accounts have been transferred. In fact, on at least several occasions, Meracord account representatives have recommended such transfers upon learning that a Front DSC has encountered legal issues and “is going to be closing the doors.” By facilitating – and in some cases recommending – these wholly fraudulent transfers of “portfolios” of victims, Meracord ensures that its steady flow of unlawful fees continues. Attorney-run Front DSCs have a special role in the Meracord Enterprise. By marketing themselves as law firms, they are perceived by consumers as more trustworthy. Attorney Front DSCs like Lloyd Ward Defendants use this false perception in their recruitment efforts. In addition, Attorney-run Front DSC members of the Meracord Enterprise, such as Lloyd Ward Defendants, often permit the use of their names by other Front DSCs in return for a cut of their ill-gotten gains. Indeed, LWA went so far as to have a formal “Affiliate Agreement,” which expressly permitted affiliated Front DSCs to “use LWA and any images, likeness, reference, web site and web site material belonging to LWA or other items developed by LWA for purposes of marketing and advertising,” in return for a substantial cut of the profits. Why do the Debt Settlement Companies I am researching seem to all have failing grades with the Better Business Bureau (BBB)? In an unfortunate turn of events, the BBB recently implemented a new ‘scoring model’. This scoring model dictates that certain industries be graded as a whole. Unfortunately in the case of debt settlement companies, this model is quite severe, and has any company, regardless of their best-practices operations or good track record, restricted from achieving any rating above C-, USOBA supports the theory behind the BBB; a consumer should have a resource to compare companies in any industry based on the company’s merits alone. 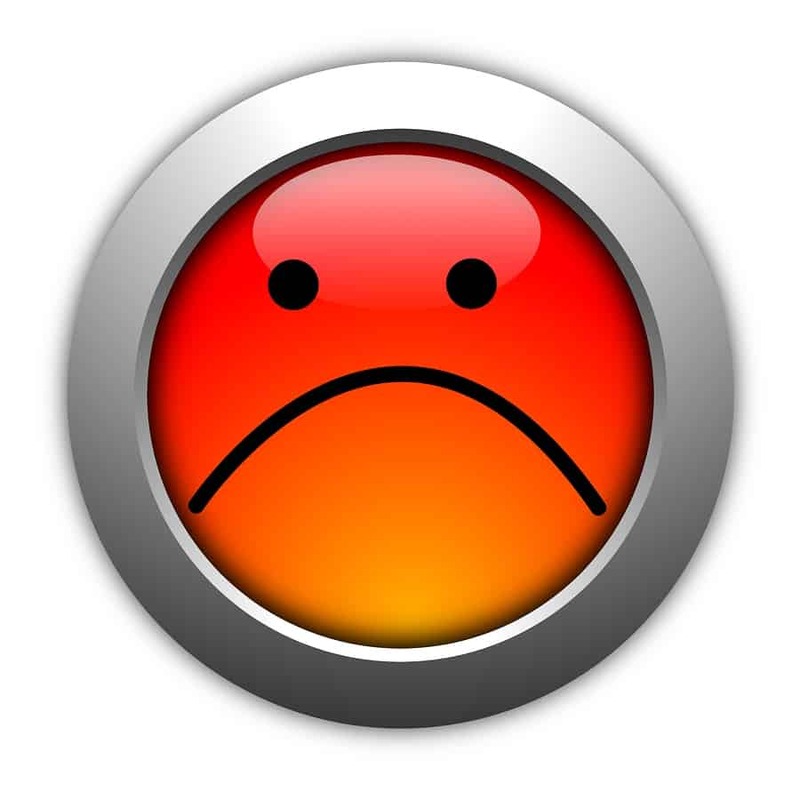 At this time, the BBB ratings of Debt Settlement companies tells a consumer little or nothing about a company’s ethics or reputability. Several USOBA members and other Debt Settlement entities were asked to “give back” prestigious awards and achievements such as the BBB Accreditation and BBB Torch Award. Prior to the scoring model change, the companies were exemplary in the eyes of the BBB. If you wish to include the BBB in your research of a Debt Settlement provider, we suggest you look carefully at the complaint resolution and not the arbitrary score. As the above allegations make clear, the Front DSCs that are part of the Meracord Enterprise are directly connected to each other through bogus trade associations as well as the formal and informal agreements described above. Thus, the Meracord Enterprise involves relationships between Meracord and the individual Front DSCs as well as relationships between and among the Front DSCs themselves – all evidenced by both the participation of Meracord Enterprise members in industry-wide events and trade associations, as well as the formal and informal agreements made among those members. The Meracord conspiracy is a classic hub-and-spoke conspiracy which also involves relationships between the various spokes. Meracord serves as the hub of the Meracord Enterprise, entering into bilateral relationships with each Front DSC, through which Meracord both directly engages in and facilitates the fraudulent and illegal activity of the Meracord Enterprise, as alleged herein. As discussed above, Meracord also causes and assists the various “spokes” – the Front DSCs – in communicating with and conspiring with each other, all for the common benefit of the Meracord Enterprise and to the common detriment of its victims, whose accounts are involuntarily shifted from one dubious Front DSC to another, with Meracord’s indispensable assistance, in order to hinder regulatory protective actions. These relationships between Front DSCs, many of which are facilitated by Meracord, benefit and advance the Meracord Enterprise as a whole. Other relationships between the Front DSCs include their bogus trade associations and countless conspiratorial interactions between such Front DSCs at various debt settlement industry functions, including those attended and sponsored by Meracord. The complaint filed contains significantly more material and for those interested in reading the full complaint, you can read it here. A tipster (send in your tips here) forwarded me a copy of a recent court document in this case that provides additional details. Meracord (formerly NoteWorld, LLC) is the hub of a criminal enterprise which preys on unsuspecting and vulnerable consumers who seek only to resolve their personal debt crisis and get back on their financial feet. Meracord engages and relies upon a network of “front-end” debt settlement companies (“Front DSCs”) that it utilizes to recruit customers; among those Front DSCs are the various entities controlled by the Lloyd Ward Defendants (hereinafter “Lloyd Ward & Associates” or “LWA”). The Front DSCs offer to act as intermediaries between distressed and distraught debtors and their creditors, using inflated claims and misrepresentations about their services to sign up customers, and charging exorbitant and abusive fees once the mark is on the hook. The Front DSCs require customers to set up an escrow account into which the customer makes a monthly deposit, generally via an automatic electronic funds transfer. These accounts are administered by Meracord, which is a “back-end” debt settlement company. In theory, once a sufficient balance accumulates in the escrow account, the Front DSCs will approach creditors and utilize the accumulated balance to settle outstanding debts for a lump sum in return for fees that are strictly regulated by law. The reality, however, is very different. Meracord represents to consumers that it is independent and unaffiliated with the Front DSCs and that consumers will at all times have control over their money. These statements are false. In fact, Meracord is deeply intertwined with and actively conspires with the Front DSCs. Indeed, Meracord actually disburses the abusive fees to the Front DSCs and for most of the Front DSCs, Meracord provides the software through which consumers view their account balances and “approve or decline” the settlement agreements with their creditors. This software in many cases represents the bulk of the “services” that the Front DSC actually provides. Contrary to Meracord’s assurances, it does not act as an independent fiduciary. Instead, together with its network of Front DSCs, it loots customers’ escrow accounts by withdrawing exorbitant and abusive fees pursuant to debt settlement contracts that are wholly fraudulent and known to Meracord to be so. Moreover, the contracts, as well as the fees charged by both Meracord and the Front DSCs, are illegal under Washington State laws regulating the debt settlement industry. In many cases, as a result of the exorbitant fees charged, it is impossible for the consumer to ever accumulate sufficient funds for his or her debts to be settled as promised. If consumers discover the fraud and attempt to retrieve the illegally extracted fees, they often find that the Front DSC is nothing more than a shell entity with no real address and no discernible ownership structure. Even if the Front DSC exists, however, the company often refuses to return any of the customers’ fees, falsely claiming – as Lloyd Ward & Associates did in Plaintiff Johnson-Peredo’s case – to have “earned” the fees. Meracord, for its part, stonewalls customers and refuses to refund illegal fees, hiding behind false claims that it “only” provides “payment processing” services; that it is “not a debt settlement company”; and that it is wholly “independent” from the vanishing Front DSCs. Attorney-run Front DSCs have a special role in the Meracord Enterprise. By marketing themselves as law firms, they are perceived by consumers as more trustworthy. Attorney Front DSCs like Lloyd Ward & Associates use this false perception in their recruitment efforts. Marie was approached by a LWA representative after seeking help online for the $35,000 credit card debt she had accumulated with Discover Bank over five years of helping to support her family. The LWA representative emphasized her status as a “professional debt arbitrator,” and promised that LWA could settle Marie’s debts for approximately 40% of the total amount owed. LWA instructed Marie to change her contact information with Discover to LWA’s address and phone number, and to stop making payments to Discover, and instead begin making payments into her new Meracord escrow account. LWA led Marie to believe that the law firm would be “stepping into her shoes” with respect to her Discover accounts, and would henceforth handle all interactions with the creditor. But when, approximately 14 months later, Marie was sued by Discover on the accounts, LWA refused to do anything to assist her. Moreover, the firm refused to return the over $3,500 in illegal “fees” that Meracord had disbursed to LWA from Marie’s escrow account. LWA claims it had “earned” the fees, despite refusing to provide Marie with any proof that it had in fact done anything to settle her debts. Plaintiffs bring this action pursuant to the Racketeering Influenced and Corrupt Organizations Act (“RICO”) and Washington state law to remedy Defendants’ illegal conduct. Plaintiffs bring this action on behalf of themselves and a Class consisting of all persons in the United States who established an account with Meracord LLC (or any subsidiary thereof) from which Meracord processed any payments related to any debt settlement program. Defendants acted – and continue to act – in concert with each other and other Front DSCs to perpetuate an unfair, deceptive, and fraudulent business scheme injurious to consumers and violative of RICO, Washington’s debt adjusting statute, WASH. REV. CODE § 18.28, and the Washington Consumer Protection Act, WASH. REV. CODE § 19.86. Defendants’ attempts to compel arbitration of the claims in this case are ill-founded. This Court has once already rejected Meracord’s contention that it can compel arbitration based upon dubious arbitration clauses in the Front DSC’s “agreements.” Its appeal of this Court’s ruling in that regard is fully briefed before the Ninth Circuit Court of Appeals. Meracord’s own “Terms & Conditions” document actually requires Plaintiffs to pursue this lawsuit in court in Washington, which is exactly what they have done. The Ward Defendants’ attempt to compel arbitration is as dubious as is its “contract.” As outlined in the Amended Complaint, the Ward Defendants’ arbitration clause is not enforceable. Plaintiffs assert various claims against the Meracord Defendants arising out of their decision to hire debt settlement companies (“DSCs”) to assist them in settling their consumer debt. Plaintiffs’ claims arise out of and relate to the debt settlement services they hired the DSCs to provide, or are derivative of their contractual relationships with the DSCs. Plaintiffs’ attempt to proceed against the Meracord Defendants on these claims rests on vague allegations of collusion between Meracord, LLC (“Meracord”) and the DSCs. Plaintiffs ultimately seek to hold the Meracord Defendants liable for the alleged conduct of the DSCs, seeking to recover from the Meracord Defendants the fees they paid to the DSCs pursuant to their DSC Contracts, rather than limiting their claims to the nominal fees paid to Meracord under their “Sign-Up Agreement” with Meracord. Plaintiffs make no claim that Meracord negligently performed its payment processing services in connection with Plaintiffs’ debt settlement efforts. Furthermore, the arbitration agreements in the DSC Contracts of Plaintiff Canada and Plaintiff Johnson-Peredo both state that such arbitration will be conducted according to the rules of the American Arbitration Association (“AAA”), which commit “arbitrability” disputes to the jurisdiction of the arbitrator. Pursuant to these arbitration agreements, the Meracord Defendants have moved (a) to stay this litigation and compel arbitration of Plaintiffs’ claims, or to dismiss those claims pursuant to Fed. R. Civ. P. 12(b)(1) or 12(b)(3), or alternatively (b) to stay this litigation pending resolution of (i) the arbitration between Plaintiff Johnson-Peredo and the Ward Defendants (as requested in the Ward Defendants’ Motion to Dismiss), and (ii) the pending appeal in Rajagopalan v. NoteWorld LLC, No. 12-35205 (9th Cir. ), which involves an arbitration agreement substantially similar to the arbitration agreements signed by Plaintiffs Canada and Hewson, as well as similar legal issues. Meracord was formerly known as NoteWorld LLC. The lawsuit in Rajagopalan, which is being litigated between Plaintiffs’ counsel and Meracord, asserts essentially the same allegations against Meracord as Plaintiffs assert against the Meracord Defendants in this action. This Court denied Meracord’s motion to compel arbitration in that case, on the ground that the arbitration agreement in the plaintiff’s DSC Contract is substantively unconscionable and that Meracord could not invoke the arbitration agreement as a nonsignatory to the DSC Contract. As the arbitration agreement in Rajagapolan is virtually identical to the arbitration agreements in the DSC Contracts of Plaintiffs Canada and Hewson, the decision in Rajagapolan should be highly relevant in determining the similar issues presented by their claims. If the Ward Defendants’ Motion to Dismiss is granted with respect to the claims of Plaintiff Johnson-Peredo, that arbitration should result in a binding determination of her claims. The Meracord Defendants contend that all discovery, other than initial disclosures, should be stayed until after resolution of its pending motion to stay litigation and compel arbitration, to avoid the parties incurring significant discovery expenses that may be rendered unnecessary should the Meracord Defendants prevail on their motion to stay litigation and compel arbitration. If arbitration is not compelled or a stay is not granted, the Meracord Defendants intend to move to dismiss Plaintiffs’ claims for, inter alia, failure to state a claim, and to seek a stay of discovery pending resolution of that motion to dismiss. In the event that motion to dismiss also is denied, proceedings in this putative nationwide class action likely will be complex. A significant threshold discovery issue will be whether discovery should be bifurcated between class certification and merits issues. Plaintiffs allege the Ward Defendants are one of scores of “DSCs” who allegedly have conspired with the Meracord defendants to assist plaintiffs in settling their debts. Plaintiffs ultimately seek to hold the Ward Defendants liable for all fees paid by a putative nationwide class, including fees paid to the Meracord Defendants, other DSCs, and other entities. The only plaintiff who contracted with one of the Ward Defendants is Marie Johnson- Peredo. She is a resident of Pennsylvania and concedes the Ward Defendants are all located in Texas. The contract contains an arbitration clause requiring that any disputes arising under the contract are subject to binding arbitration. The contract also provides that venue for arbitration shall be in Dallas County, Texas. The Ward Defendants have moved to dismiss plaintiffs’ amended complaint on the grounds that this Court lacks personal jurisdiction over the Ward Defendants, lacks subject matter jurisdiction due to the arbitration clause, and venue does not lie in Washington. The Ward Defendants agree with the Meracord defendants that all discovery, other than initial disclosures, should be stayed until after resolution of the Ward Defendants’ pending motion to dismiss and the Meracord defendants’ pending motion to stay litigation and compel arbitration, to avoid the parties incurring significant discovery expenses that may be rendered unnecessary should the Ward Defendants prevail on their motion to dismiss and/or the Meracord Defendants prevail on their motion to stay litigation and compel arbitration. If these pending motions are denied, the Ward Defendants intend to move to dismiss plaintiffs’ claims for, inter alia, failure to state a claim, and to seek a stay of discovery pending resolution of that motion to dismiss. In the event that motion to dismiss also is denied, proceedings in this putative nationwide class action likely will be complex. The Ward Defendants concur with the Meracord Defendants that a significant threshold discovery issue will be whether discovery should be bifurcated between class certification and merits issues. Accredited Financial CorporationAmanda WardAmber NetworkBest Debt OptionsBeyond Financial ServiceBrite CreditBrite Credit 123Century NegotiationsCharles RemsbergChris GarrisonClear Debt SolutioncniCoastal Debt SolutionsConsumerwise Debt SolutionsCounsel 4 Debt ReliefCountrywide Debt SolutionsCredit Care CorporationCreditCare ProDebt EraseDebt Help Center USADebt National ReliefDebt Reinvestmentdebt-solutionsDebtPointerDebtProDTS Financial GroupE.A.C. FinancialExpert Settlement ProfessionalExpress Debt Settlement HoldingsFBL AssociatesFirst Rate Debt SolutionsFreedom Debt Centerfreedom debt solutionsfreedom-debt-reliefHelp Settlehelpsettle.comInnovative Debt SolutionsKevin DevotoLaw Office of Simon & BockschLifeguard FinancialLinda RemsbergLloyd RegnerLloyd WardLloyd Ward and AssociatesLloyd Ward Group IILloyd Ward PCLlyod Ward & Associatesmaximum Debt SolutionsMeracordMike MilesMorgan Stevens Financial Solutions CompanyNational Financial FreedomNationwide Consumer Advocacy GroupOn Track FinancialP&E SolutionsPersonal Debt Systems of AmericaPrinceton Debt ManagementReduce My DebtSettle A DebtSettlement Compliance CommissionSettlement Corporation of AmericaSilverLeaf Debt SolutionsThe Debt AnswerThe Debt CureThe Lloyd Ward GroupUS Consumer ReportVision Debt.comWard HoldingsWorld Debt Solutions.